If you’re looking for frequent flier seat availability during a busy peak travel period, it can be really tough. Often the biggest problem is the most frustrating one: flights to and from airline hubs. You might be able to find, for example, a flight “over the water” from Europe to a hub city, but not onward to your home city from there. This is why it’s really important to shop your flights one segment at a time, and to look at unconventional ways of reaching your final destination. Flag stops are a rarely used technique and can really help when inventory is tight. Most people would just pay up. After all, even with the additional cost of a paid onward ticket, the overall redemption would still cost less than the fuel surcharges involved when booking on British Airways. However, don’t pay up before looking for a flag stop. What’s a flag stop? It’s a non-standard connection, sometimes (though not always) inconvenient, occurring in a non-hub city. Because these connections are non-standard (particularly if they involve partners) and would not normally be sold, they typically don’t show up in automated searches and have to be pieced together one segment at a time. Having an extensive knowledge of airline route networks and available partners works well here. I knew that this was coming, and had done some research on the Alaska Airlines Web site prior to calling. Although you might not expect it, Alaska Airlines has one flight a day from St. Louis to Seattle. With a forced overnight in Seattle (which didn’t count as a stopover because it was 23 hours, not 24 hours), there would be onward availability the following morning to Las Vegas on another Alaska flight. The only piece I wasn’t sure of was a connecting flight to St. Louis. “Not yet,” I said. “I found availability on Alaska Airlines from St. Louis. Do you have a connecting flight there?” The agent replied in the affirmative, and a few minutes later, was issuing me a ticket for a grueling and complicated 3-stop itinerary that would take me all the way to Las Vegas with no fuel surcharges. Of course, I didn’t actually want to fly this awful itinerary. It would have gotten me there if I couldn’t find anything else, but I was hoping to replace it with something more sane. 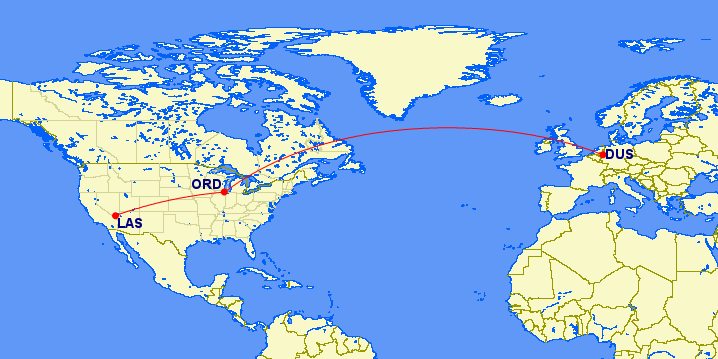 One nice advantage with American Airlines awards is that you can make essentially unlimited changes to the routing as long as your origin and destination cities are the same. This means that if space opens up on a more convenient itinerary, you can make the change with a simple phone call. Also, if your itinerary later breaks anywhere along the way due to a schedule change, American Airlines will generally open up inventory on their own flights to get you to your final destination. With a complicated itinerary like this, a lot could potentially go wrong so I figured the chances were better than even that I could score a better itinerary because of a schedule change. In this case, I lucked out. Alaska Airlines changed the schedule of their St. Louis to Seattle flight, which resulted in a greater than 24 hour stop in Seattle. This was no longer “legal” under the fare rules, because it constituted a stopover. These are not allowed. So, when I called to inquire about the change, the American Airlines representative noticed the issue. She started off by telling me that my entire itinerary would be cancelled because I had booked an invalid connection. When I explained that the invalid connection was there because of a schedule change and I didn’t actually want the stopover, she said “Oh! Let me see if I can get you a better itinerary than this.” She contacted the Revenue Management department, who then decided to open up award inventory for me on an American Airlines connecting flight from Chicago to Las Vegas. This itinerary was much more reasonable. 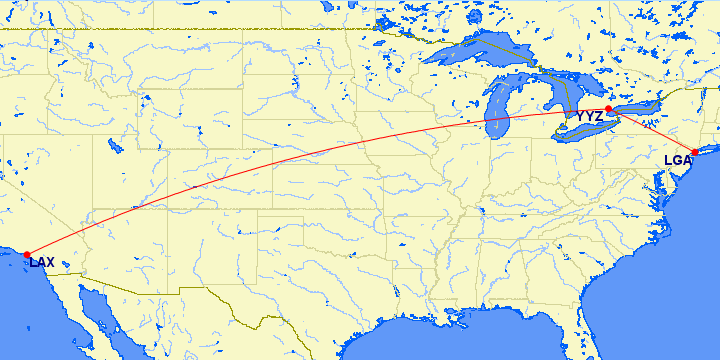 Fast forward to two weeks ago, when I needed to get from New York to Los Angeles–again on an American Airlines award. I only needed an economy class seat, but no award space was available. I decided to work backwards, looking for nonstop flights from east coast destinations to Los Angeles. To my surprise, I found an early afternoon flight from Columbus, Ohio with availability. So, all I needed to do was to find a flight from a New York area airport to Columbus that would connect. I was in luck! There was an almost perfectly timed connection available from LaGuardia Airport. Although this isn’t an itinerary that would normally price out as a paid fare, adding Columbus as a flag stop proved to be perfectly valid when I searched for the award space one segment at a time. The itinerary priced out correctly at 12,500 miles and my checked bag did transfer correctly at Columbus. The next time you’re looking for a hard-to-find seat, look for flag stops. It takes extra time–both when searching and when flying–but you may be able to magically find inventory when none existed only moments before. With the increasing difficulty of using frequent flyer miles, it’s no surprise that many people are seeking to redeem on partner airlines instead. This sometimes creates situations that would rarely arise before, and one of those situations is called “cabotage.” Ever since another travel blogger, Jeff from Canadian Kilometers, lodged a cabotage-related complaint with the US Department of Transportation, it has made it a lot harder to book awards between US locations while transiting third countries. 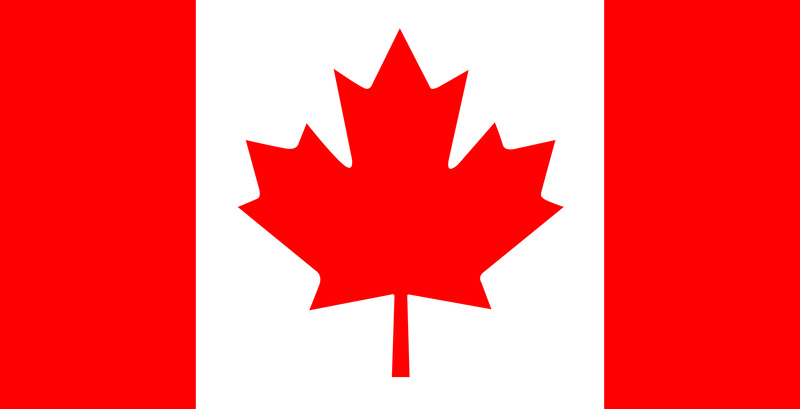 If you were to fly Air Canada from Los Angeles to Toronto, and then connect to another Air Canada flight from Toronto to New York, this would be cabotage because a foreign airline carried you the entire way between two US points. And Air Canada would be slapped with a huge fine. It’s $25,000 each time, so they have a strong incentive not to do this. Making matters worse, you might even be able to book this itinerary as an award flight if the airline you’re using has a badly programmed booking engine, causing you unexpected trouble at the airport. This is what happened to Jeff, who booked a flight from Seattle to Guam on Eva Air, via Taiwan. He was (correctly) denied boarding because this would create a cabotage situation, torpedoing the risky hidden cities itinerary that he’d planned on the mistake fare he found. Rather than accepting that these things can happen when you play dangerous games, he filed a complaint with the DOT and created a situation where even entirely legitimate itineraries can now be difficult to book, and some itineraries are no longer possible to book at all with Avianca LifeMiles. How do you avoid cabotage? It’s really easy: make sure that at least one part of an itinerary between US locations, which transits a third country, is on a US carrier. 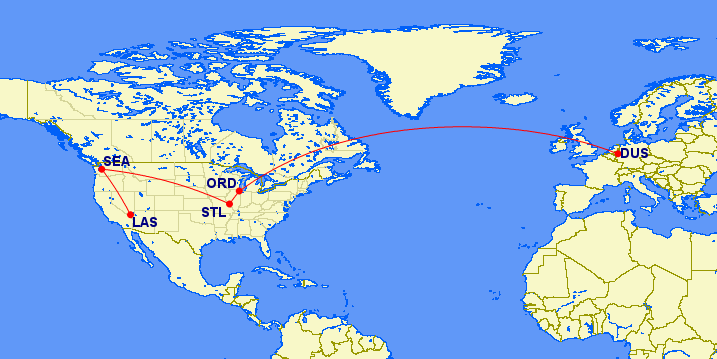 So, for example, it’s totally OK to book a flight from Los Angeles to Vancouver on Alaska Airlines, which then connects to a flight from Vancouver to New York on Cathay Pacific. This is not cabotage. In fact, I am doing this right now. Similarly, Jeff could have flown ANA to Tokyo, and switched to a United flight to Guam. You can even transit a city in a third country using a US carrier and this is also no problem. So, for example, if you want to fly from Seattle to Las Vegas via Vancouver BC on Alaska Airlines (which you might want to do if award inventory is only available with this itinerary), it’s entirely OK and there is no cabotage. You would have to pay both US and Canadian immigration and airport fees, though (and endure all the immigration hassles, and travel with your passport) so this is probably something you don’t actually want to do unless it’s truly necessary. As long as you know the cabotage rules, you can probably manage to book itineraries that don’t actually involve it, but it might require booking over the phone and appealing to a supervisor in order to get it done. Plan extra time at the airport in case you’re challenged. And be aware that airline search engines are imperfect. They may recommend (and allow you to book) itineraries that involve cabotage and will result in you being denied boarding at the last minute. Conversely, they may not display itineraries that are perfectly valid and don’t involve any cabotage, but do transit through a third country. In this case, you may have to piece these itineraries together manually. 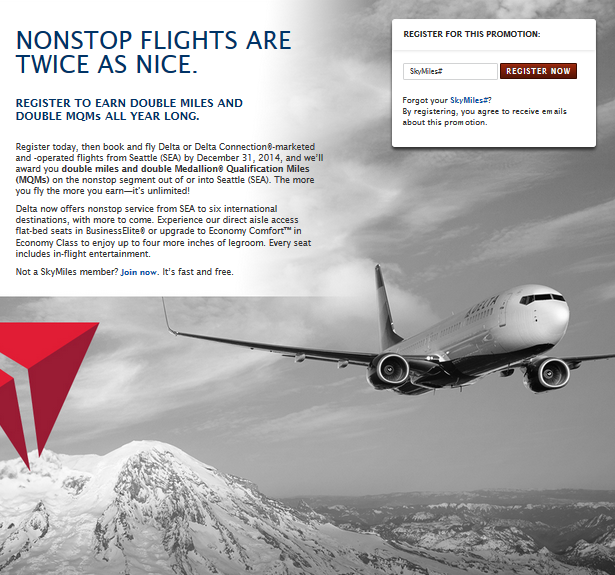 As always, the thrill is in the hunt when traveling on miles and points. Avoiding cabotage situations sounds difficult, but in reality, it’s really simple: always book at least one leg (either into or out of the US) on a US carrier.